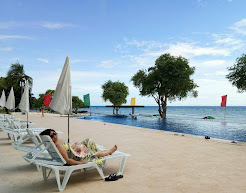 Do you know that lunch break is one of the most important part of the day for busy working people like us? That is based on my experience. Before going to work, having quick breakfast or none at all, can ruin our work performance. That is why lunch break was created. 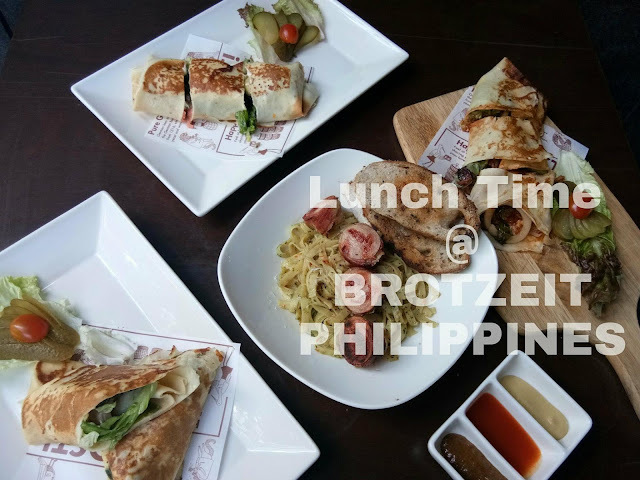 And my good news... Brotzeit Philippines offers 19 new dishes to fit your budget and your hungry tummy. You can have light meal and real heavy meal as well. The new lunch menu starts from P265 only. For the starter, a healthy salad is the best. 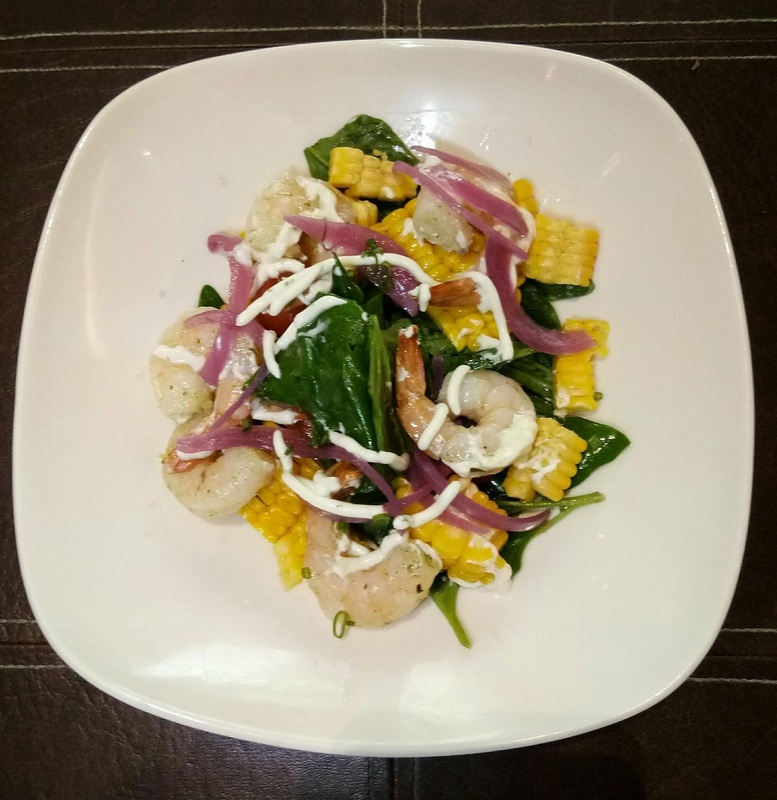 GRILLED SWEET CORN and PRAWN SALAD. This is a light choice. You know, how much I love prawns. 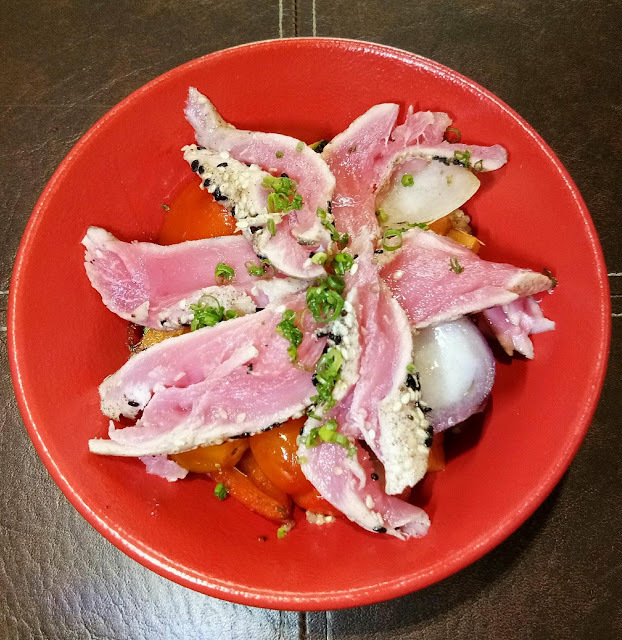 Pork plus beans...Yes, PORK & BEANS bowl. This can be a kind of so Pinoy food, the German version. 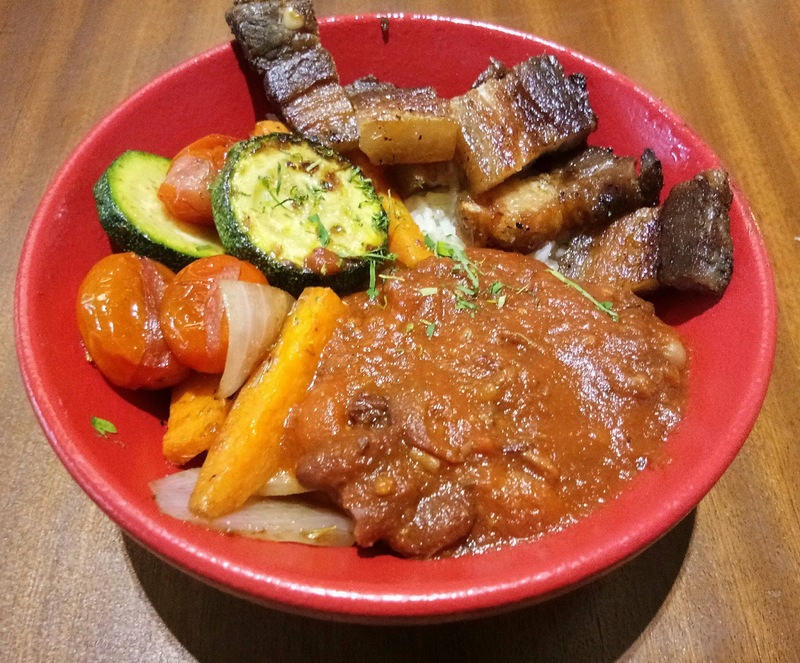 Crisp Pork belly with Bavarian stewed beans, roasted vegetables on top of steamed rice. 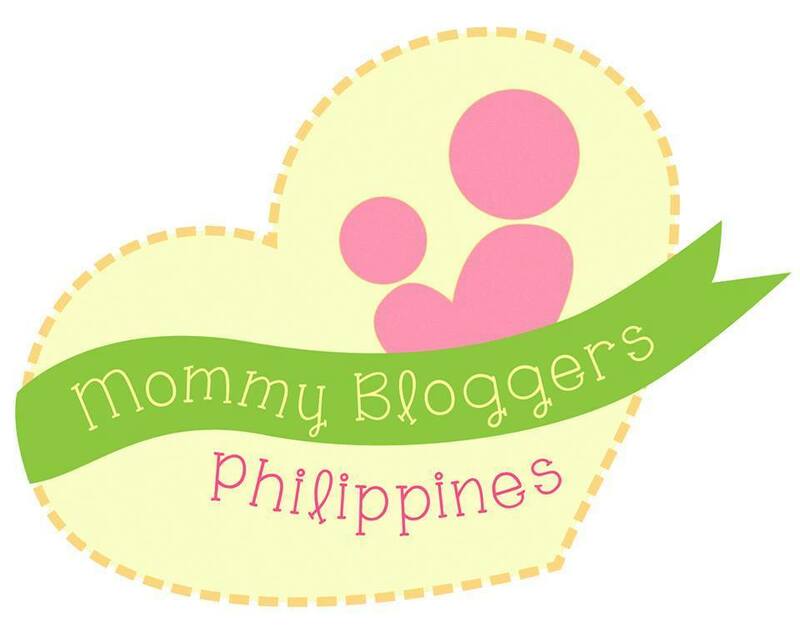 So, if you missed your mom's breakfast or lunch, you can have it here for lunch. SEARED TUNA, sesame crusted seared tuna with roasted vegetables and quinoa risotto. This is my young foodie's favorite. While I'm the finisher for the healthy quinoa risotto and zucchini. 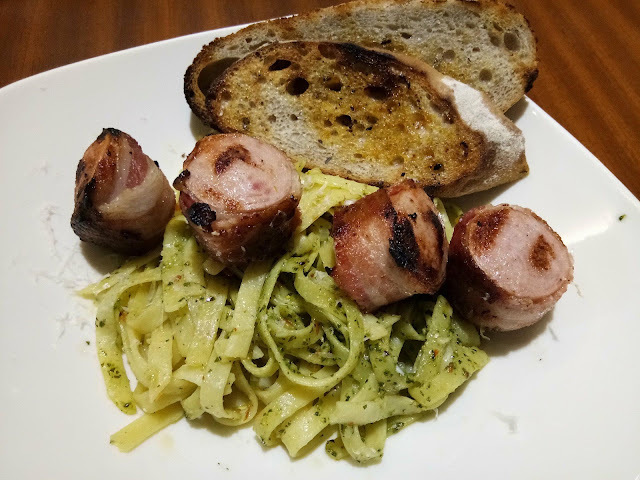 SAUSAGE MEDALLIONS, bacon wrapped garlic sausage, fetuccine in oglio and pesto grated parmesan. What can you ask for? Sausage wrapped with bacon! My young foodie had a great meal because of this one. You'll never go wrong with bacon. 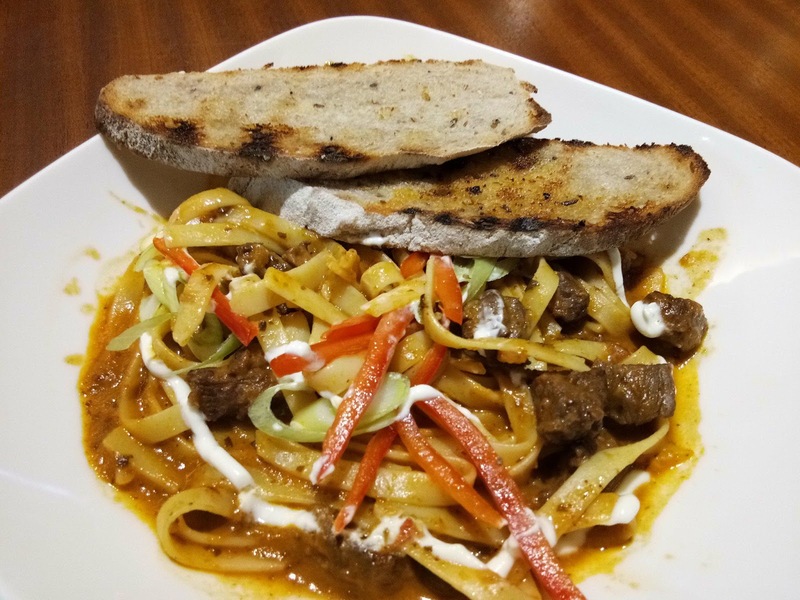 BEEF GOULASH with FLAT NOODLES, is simply a stewed brisket over flat noodles. A simple look for of real good taste. Yes, tender beef brisket to save your time from chewing to head back to work from lunch break. 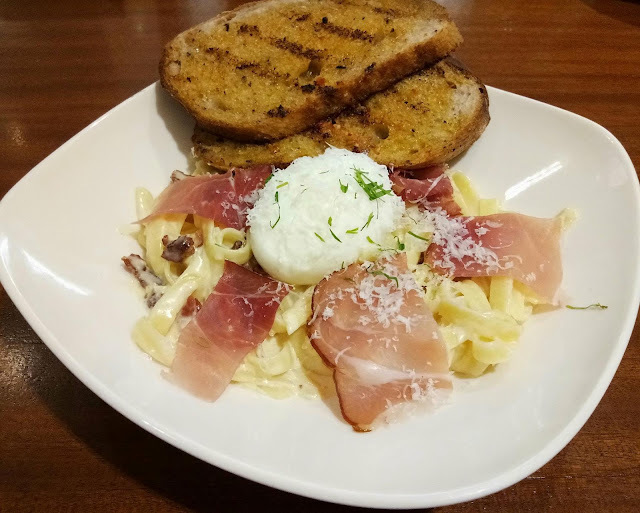 BLACK FOREST HAM with FLAT NOODLES, German-style Carbonara with flat noodles topped with creamy sauce, bacon, black forest ham and poached egg. 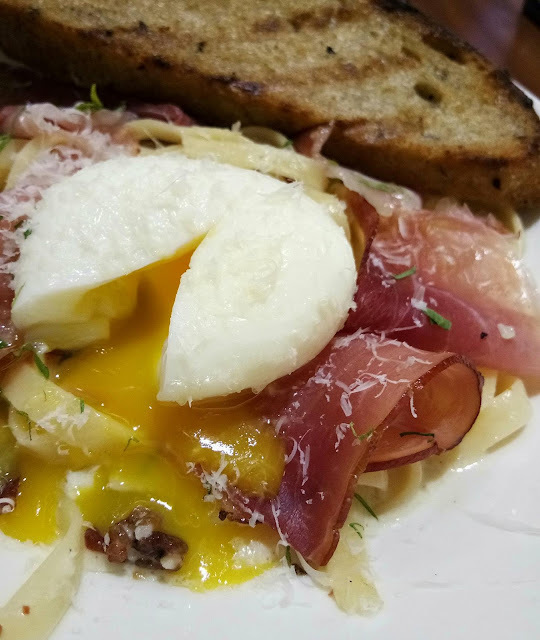 I love the drama of breaking poach egg. It's so perfect with the tasty ham. Abi, loved it so much. 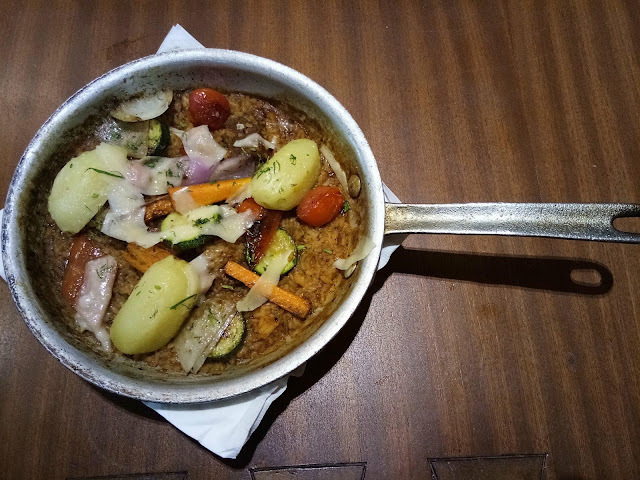 STEWED PORK, a pan of stewed pork with rice, roasted vegetables, steamed potatoes and parmesan. This one has a little kick of spice. A complete pork meal with flavorful rice and veggies. 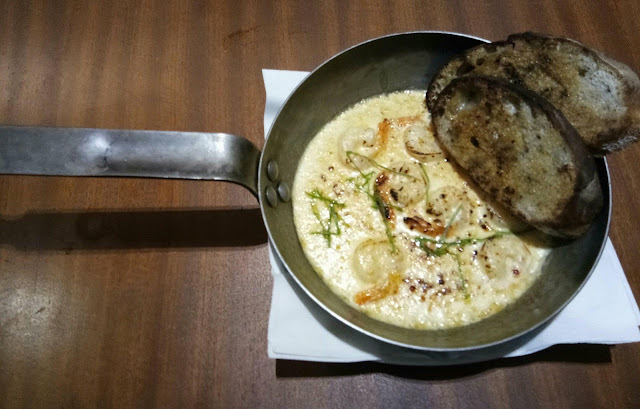 SHRIMP THERMIDORE, gratinated prawns in creamy sauce served with toasted bread. Oh, I'm telling you, once you start with your bread scooping the shrimp, you will definitely ask for more. 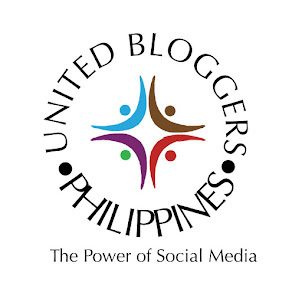 But if you are not the bread person, a cup of rice is a good tandem. It's so good! I can't forget the shrimp swimming in this creamy sauce. 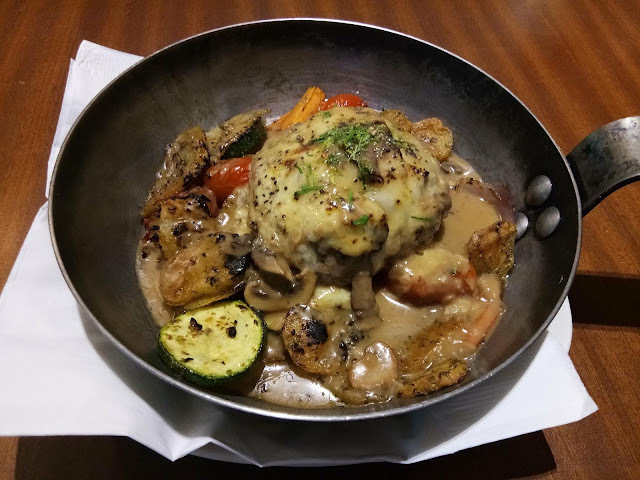 BROILED GROUND BEEF, topped with Emmamtal, mushroom gravy, roasted potatoes and vegetables. If Mr. Ang was with us, he'll surely love this. Though I love it too. The creamy mushroom sauce compliments the beef ball and the veggies. 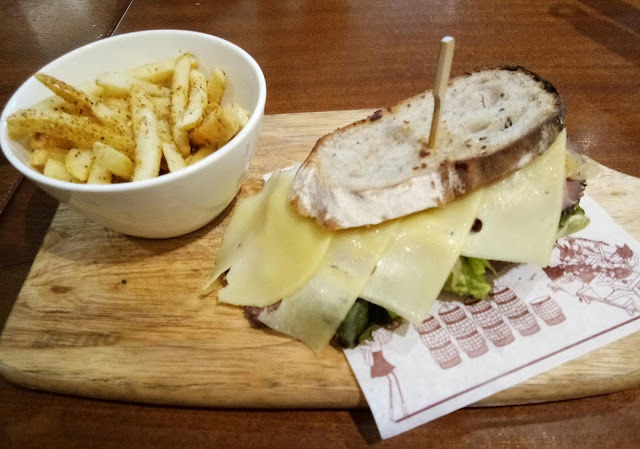 REUBEN, beef pastrami, emmenthal cheese, sauerkraut on crusty sour dough with pommes. Gosh, the generous layers of cheese makes me want to shout! 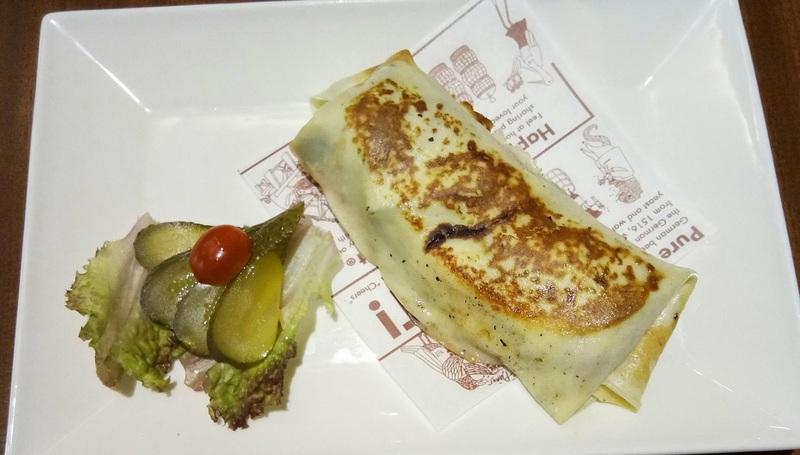 Brotzeit also have three kinds of crepes served for lunch. 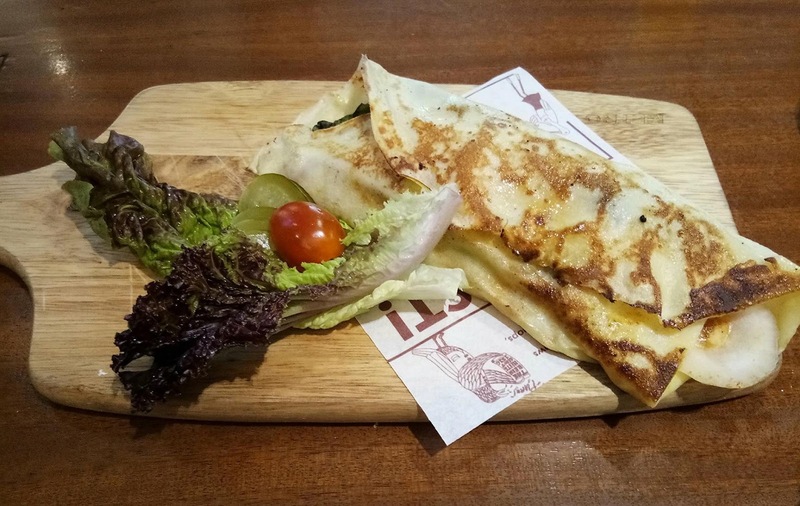 They have SEAFOOD Crepe, that comes with smoked salmon, tuna, prawns, salad lettuce, sour crem in savory crepe. 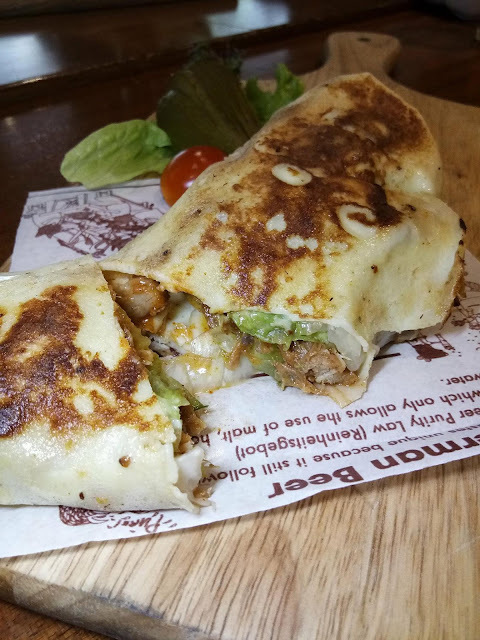 They also have my favorite SMOKED HAND and CHEESE crepe and PULLED PORK Crepe. Name it! PULLED PORK CREPE, BBQ pulled pork with Japanese cucumbers, onions, lettuce in savory crepe. 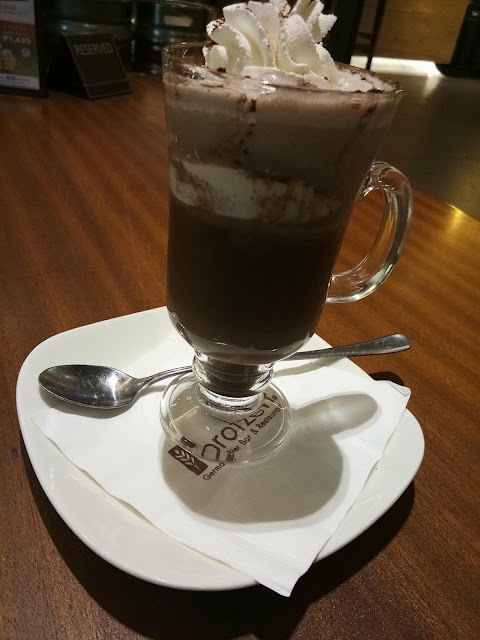 It's so yummy. Delicious to my tummy! 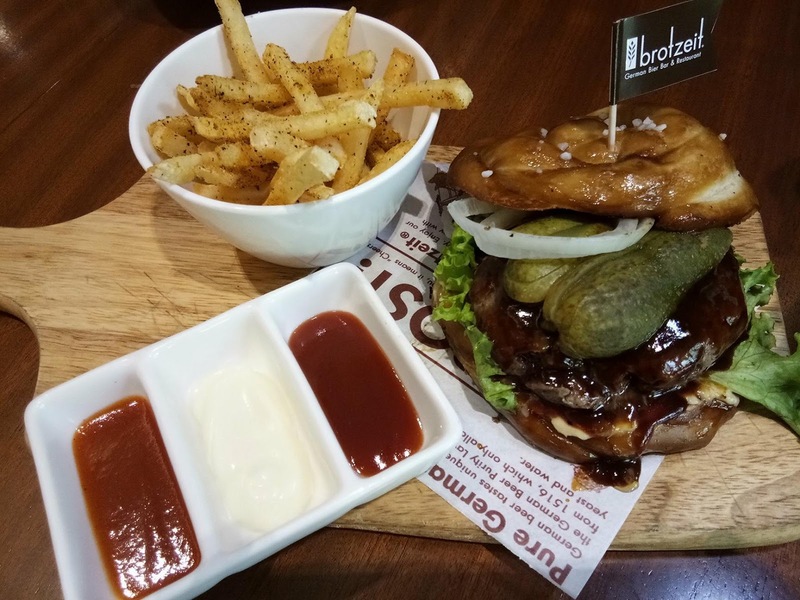 BROTZEIT BURGER, a 1/3lb beef patty with bbq sauce, garlucmayonaise, lettuce, gherkins on pretzel bun served with pommes. 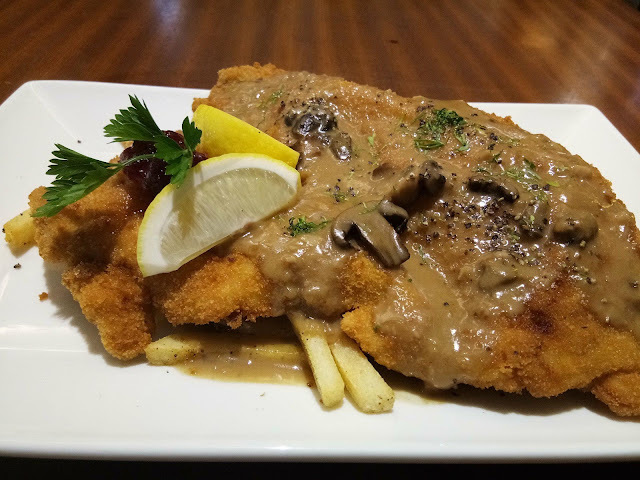 HUNTER PORK CUTLET, is a breaded pork cutlet with mushroom sauce and pommes. Yes, bed of fries down there. 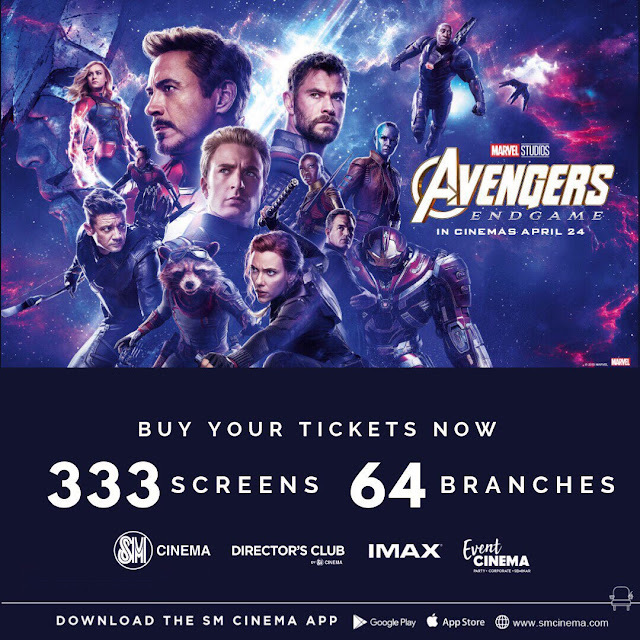 Yes, you can have your lunch for as low as P265 only.